If we go by the typical standard metrics by which cosplay is judged, you might say this cosplay isn't very good. That it's bad. Or even terrible. But those standards don't matter. This is totally wonderful, incredibly creative, and utterly brilliant. Meet Anucha "Cha" Saengchart. By day, he works as a caretaker for the elderly. In his free time, he runs Facebook page Lowcost Cosplay. Instead of tracking down special fabrics or other materials, the idea is that you cosplay by using whatever you have in the house—like eating utensils, plungers, towels, baking flour, etc. As pointed out last January by The Bangkok Post, Lowcost Cosplay launched in December 2013. 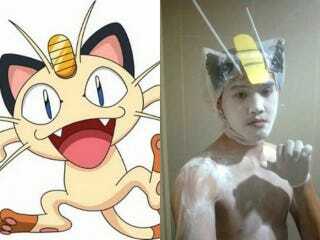 Since then, it's become popular online in Thailand, with fellow like-minded lowcost cosplayers also contributing pics.